Property 9: Charming old stone villa early 1600's. Breathtaking view, Pool, WiFi avalable. Property 13: Cool Villa, exceptional well equipped house in a fabulous location, book now! Detached villa with private pool 500 meter from village. Great panoramic views!! Property 20: Detached villa with private pool 500 meter from village. Great panoramic views!! Property 32: Luxury villa with pool, tennis court, in idyllic Umbrian countryside. Sleeps 8. Our family of four had a wonderful week in this thoughtfully designed and spacious home. I use the word home rather than house because from the shelves full of books and the paintings on the walls to the comfortable couches it's clear this isn't a cookie-cutter rental but a beloved family place. 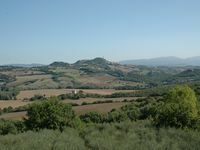 The views are beautiful and the private and peaceful location- just outside lovely Todi- is a great central location for exploring Umbria. Thank you, Sergio, for the generous welcome basket and for sharing your corner of Umbria with us. Charming and comfortable house set in stunning countryside. This is a beautifully restored and well-appointed country house that whilst being set in the heart of the countryside is easily accessible. All the rooms are generously sized and very comfortable. The star of the show is the sitting room with its huge fireplace that made the room so welcoming this Christmas. Aside from that the house is very well heated throughout - not always the case in old country houses. The kitchen is very well equipped too - a true home from home. The team who look after the property achieves the perfect balance of professionalism and friendliness - as we were spending Christmas at the house I had some very specific requests all of which were accommodated without fuss and Sabrina&rsquo;s attention was very much appreciated. We were made to feel very welcome and our only regret was having to leave! I cannot recommend this enchanting place highly enough. Thanks to all for making such a perfect Christmas-time for our far-flung family.